Ignacio says: This is a redesign of my first idea published on tokyoflash blog, Ronu. I always loved my first idea, but in 2011 (the year I designed it), I had no idea of 3D, as you can see. It’s some ugly the design I did, isn’t? That’s why I redesign it, trying to do the best I know to date, trying to refresh it, to upgrade it. This time, trying to adapt it to the present day, I thought it will incorporate a e-paper screen, which fits so well to the design. The read is simple. The horizontal mark facilitates where the exact hour is showed, to the far right (where would be the number 3 on a classic watch). From right to left (or inner ring to outer), hours, minutes, and seconds (in date mode, it would be month, day, and year). As new features over the previous design, this includes the seconds, an alarm, display date, and touch sensitive screen (with a simple configuration to make it easy to change the time or date, set an alarm, turn the backlight on or switch between modes). 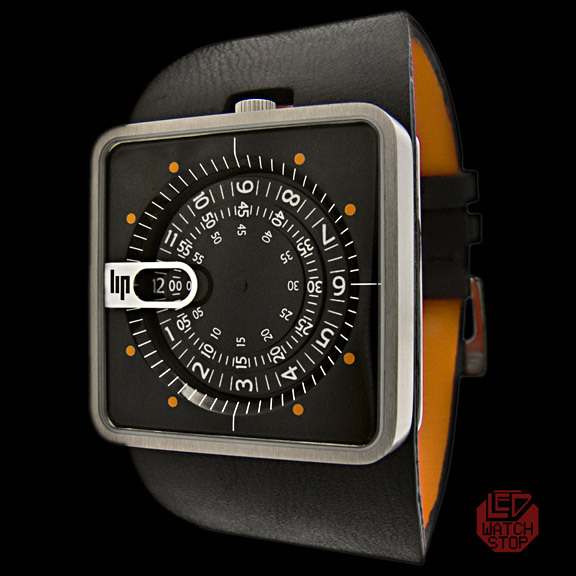 It’s a modern, futuristic, cool, strange but striking watch. I see normal people who likes minimalism, strangeness, functionalism, simple but effective. Though technically I don’t know if e-paper refresh fast enough to my idea, its display. The idea of see every hour, every minute and second in the screen and see the time is continuously moving, flowing. It is exactly the opposite of an analog clock. Is stop the needles and move the time. This entry was posted in Design Submissions, Watch Designs and tagged Analog, disc, E-Paper, easy watch, futuristic, Minimalist, Watch Design Submission. Bookmark the permalink. ← Cassini analogue watch with 24hr mode. Nice design Ignacio! A definite improvement on the original. I like the mix of complex & simplicity. I’m trying as fast I can to fix the animation files problem. I choose e-paper because it fits very well to the idea. The analogue discs are a good idea too, but I thought in a technological redesign of the idea. I think the discs would be more interesting stacked up like a pyramid. The feature I really like about your design is that you can see the highlighted numbers that designate the alarm, so you can visually see it approaching. p.s. I think Ronu V1 is just as cool as this. Muy interesante este concepto que presentas. Me gusta como tal. En general me parecen muy acertadas las soluciones que propones, lo único que me produce algunas dudas es la tipografía y su tamaño…no se… todo tiene el mismo valor visual… tal vez aumentar el cuerpo de las horas? ?… hacer más “light” los segundos? ?… en fin son sólo sugerencias…me parece como te he dicho antes un buen concepto. I agree with xian- that alarm visualization is very cool. I would definitely buy this! The alarm visualization is the best feature. E-paper can’t refresh at this rate. This could be fixed by changing the second at every 2 seconds.